The magnetic lines of force are lines from the North to the South poles where the magnetic field is of equal value. There are, in theory, an infinite number of them surrounding a magnet, but in drawings a few only are selected to represent them, as also happens when iron filings are used on a paper, they naturally clump together in lines. Linear aligned atoms of a magnetic material forming a dipole. This results in polarisation of electrons and they flow in opposite directions. This ionizes the core as the passage of electrons are on the surface of the magnetic material. So the electrons accelerate away from the core of the magnet. If we place a iron dust on a paper, the particles will be aligned, clearly showing the magnetic energy patterns. To observe the magnetic field lines around current carrying conductor. 1. 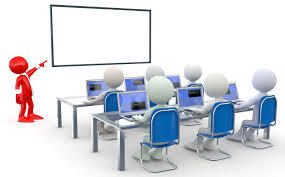 Magnetic effect of electric current is one of the major effects of electric current in use, without the applications of which we cannot have motors in the existing world. 2. A current carrying conductor creates a magnetic field around it, which can be comprehended by using magnetic lines of force or magnetic field lines. 3. The nature of the magnetic field lines around a straight current carrying conductor is concentric circles with centre at the axis of the conductor. 4. The strength of the magnetic field created depends on the current through the conductor. 5. The direction of the magnetic field lines of force around a conductor is given by the Maxwell’s right hand grip rule or the right handed corkscrew rule. Imagine that you are holding a current-carrying straight conductor in your right hand such that the thumb points towards the direction of current. Then your fingers will wrap around the conductor in the direction of the field lines of the magnetic field (See Fig.1). This is known as right hand thumb rule. A battery (12 V), a variable resistance (or a rheostat), an ammeter (0–5 A), a plug key, and a long straight thick copper wire. 1. Fix the cardboard and insert the wire through the centre of cardboard such that it is normal to its plane. 2. Connect the wire with rheostat, ammeter, battery and plug key in series. 3. Sprinkle the iron filings uniformly on the cardboard. 4. Keep the variable of the rheostat at a fixed position and note the current through the ammeter. 5. Close the key and gently tap the cardboard. 6. Observe the pattern of the iron filings over the cardboard. 1. You will observe that the magnetic field lines are formed in concentric circles around the current carrying conductor. These lines do not intersect each other and are equidistant from each other. 2. The direction of the field is perpendicular to the conductor. 3. 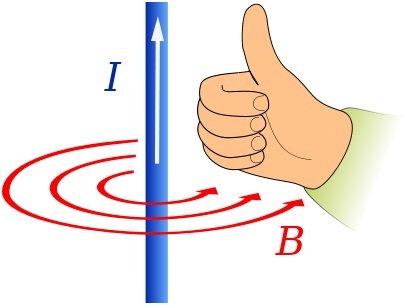 The magnetic field (B) acting on the object O increases as the current flowing through it increases. 4. The field increases as object O is closer to the conductor and decreases as it moves away from the conductor. 5. The direction of magnetic field lines gets reversed if the direction of current is reversed. o	In the above figures, note that there are current carrying conductors in opposite directions. In both cases, the current carrying conductor is intercepted by a cardboard placed at right angles to the current carrying conductor. o	There are some iron fillings sprinkled on the conductor. o	When current flows through the conductor, the iron filing arrange themselves along the magnetic field. o	We can see that the magnetic field in both cases is in opposite directions as is the current. o	The magnetic field produced by a current-carrying straight wire depends inversely on the distance from it and directly on the current passing through it. o	From this we see that the current carrying conductor produces a magnetic field around it. The direction of this magnetic field is given by Right Hand Thumb Rule.